I was traveling through the Far End the other day, and it occurred to me that there’s no reason to go here other than End Cities. And since those cities are so rare, traveling through here feels more like a chore than a game. Traveling thousands of blocks to a stronghold in the Overworld is fun because there’s a lot to see and do in each biome. 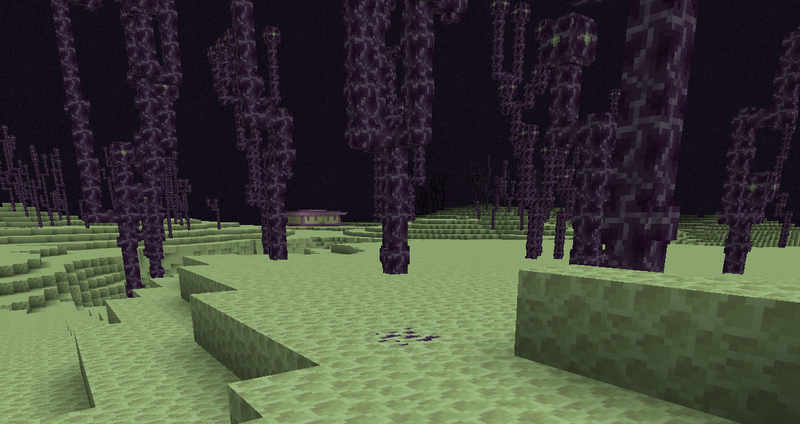 There are only three things to do in the End: Collect chorus fruit, kill endermen, and raid end cities. My solution today by no means solves this problem, but it does help by giving the end one cool thing. 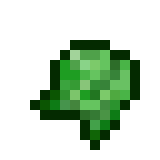 Plutonium is a new resource found in the Far End, at the same rate as diamonds in the overworld. It can also be found in the overworld, at the same rate as diamonds in the end. It generates all alone, in veins of one. Plutonium is a late-game material that requires competence. If used correctly, Plutonium will provide infinite fuel and redstone power. But if handled incorrectly, you will die. And, it’s quite easy to mishandle. If you step on Plutonium ore, it will explode. All mobs avoid plutonium, but if you aren’t paying attention you could knock an endermen into some plutonium, and that’s bad for everyone. Only the ore block is destroyed in the explosion. The biggest problem is the release of Radioactive Air in a 5x5 block area. This air variant gives the player and all mobs (except the undead) a “radioactive” effect, basically a slower version of Wither with mining fatigue. The player’s hearts turn bright green and will take constant damage until they leave the area. Radioactive Air will exist for a full 20-minute day before returning to normal. While it does not affect blocks, the moment any block is destroyed the semitransparent air will rush in, preventing further construction. Edit: animals are also immune to radiation, because exposing them to harmful effects is animal cruelty. Plutonium can only be mined with a diamond pickaxe, taking as long as obsidian. As you mine the block, the outer purple layer gives way to a bright radioactive green. I know plutonium isn’t really green, but it’s cooler this way. If at anytime during the mining should you let go of the pickaxe, the plutonium explodes. This include attacks from nearby hostiles, so make sure there aren’t any Chorans nearby. As a general rule of thumb, it’s best to keep a safe distance from plutonium. Once the Plutonium is mined, you will obtain raw plutonium. Congrats, you’ve just received one of the most useful and dangerous items in the game! Raw Plutonium can craft a Radioactive Torch, which acts the opposite of a Redstone Torch. Radioactive Torches are by default offline. A Block of Plutonium serves as the opposite of a Redstone Block, depowering all nearby lines. One endstone, one redstone dust, one iron ingot, and one plutonium can craft a Hidden Plutonium Block. The Hidden Plutonium Block looks just like a regular endstone block, but upon activation turns into green plutonium ore and releases the gas (without exploding thanks to the iron). The slow health decay + mining fatigue makes this is a perfect trap. 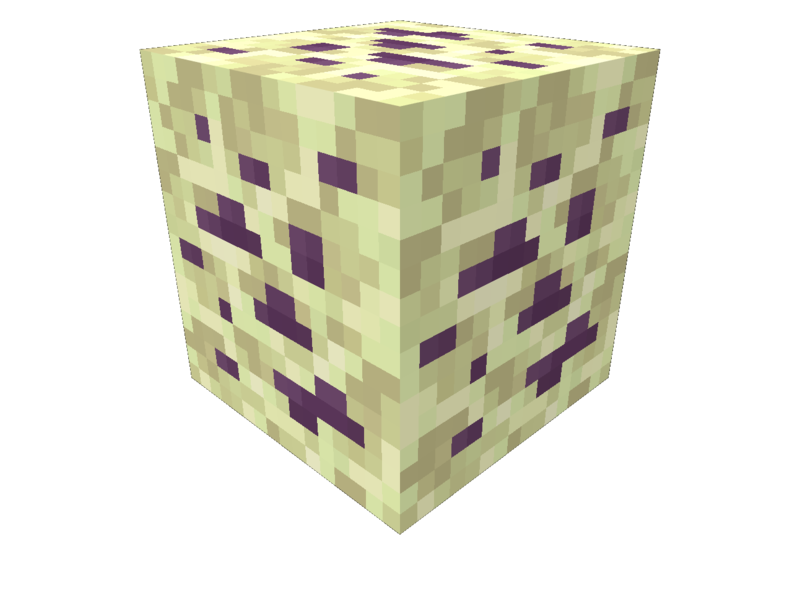 Plutonium can be combined with tnt to create Charged TNT, which is as powerful as a charged creeper. Fortunately, it does not release radiation. Feed a creeper raw plutonium, and it will become charged for you. Two raw plutonium must be crafted together to create a Plutonium Rod. The Plutonium Rod can be placed on the ground to provide neon green light. However, any mob within a 3-block radius will randomly take damage on occasion. Mainly for builders, not very practical. The real use for the rod is fuel. Plutonium Rods will last (in theory) forever. The Rod will stay there with no cooldown, only disappearing when you take them out. Plutonium automatically stops when there’s nothing left. Even better, nuclear power operates triple the speed of primitive fossil fuels. But there’s a catch: Plutonium has a chance of exploding, triggering a meltdown. The meltdown will destroy the furnace, and everything inside, plus spawn some bad air. Meltdowns = bad. You may have noticed plutonium increases exactly 32 times. That’s because of good old redstone power. The initial power of a Nuclear Furnace is 32 redstone dust, strongest in the game. However, once it goes up the power starts to decrease by one. That means the moment it reaches 3.125%, the redstone line goes to 31 power. In this way you can create “meltdown warnings” with redstone lamps, which turn off the moment the furnace weakens enough. This is very important, because it wouldn’t be fun if you had no idea how dangerous the rod was. You may consider radiation more of a nuisance than a threat. Radiation is ultimately a balance to the otherwise overpowered uses of plutonium. Luckily, there are some expensive ways to get around it. Dragon’s Breath will instantly eliminate radioactive air. It’s a good mint. Unfortunately, Dragon’s Breath can be corrupted into the potion Wither’s Breath. The Wither’s Breath releases radioactive air with the splash of a bottle. Since it’s probably the most powerful PVP item, it’s only accessible through the dragon boss fight. An easier solution is to enchant your helmet with Mint. Mint grants full immunity to radioactive air, but for every second in radioactive air it will take durability. Plutonium is a rare end ore serving as a powerful late-game fuel. But it’s very dangerous. Plutonium Rods are much faster and longer than coal but has the chance of initiating a “meltdown” which destroys the furnace and corrupts the air for a limited time. Luckily you can keep track of the meltdown chance. You may believe Nuclear Power is too advanced for Minecraft’s timeframe, and that’s a good point that initially deterred me from this idea. But thinking about it, I don’t think Minecraft has an exact time frame. There’s already sentient robots (iron golems) in the game. It’s just a matter of what fits. I’m not suggesting we had nuclear bombs to Minecraft. I’m suggest a late-game yet dangerous alternative to coal, with a few uses sprinkled in. I’m also suggesting a new use for dragon breath, and something to do in the otherwise empty end. Also, it would teach children to properly handle plutonium, in the unlikely and scary event an 8-year-old obtains a nuclear bomb. It can also be found in the overworld, at the same rate as diamonds in the end. When were diamonds findable in the end? And having it spawn in the overworld, even rarely, does sort of nullify "the end getting something new". Apart from that, I do think this is a good idea and one that I support. There are a few issues with this suggestion - you are asking for colored lighting ("The Plutonium Rod can be placed on the ground to provide neon green light") and redstone having twice as many power levels as it currently has ("The initial power of a Nuclear Furnace is 32 redstone dust") - both of which would require significant code rewrites (redstone currently only has 16 levels, from 0-15, and colored lighting is out of the question unless Mojang actually optimizes their game for a change (TMCW obliterates 1.12/1.13 in performance - I can launch the game and generate a new world in the time it takes them to simply start up, and that isn't just due to my own optimizations as vanilla 1.6.4 is nearly as fast, but it is much simpler. One of my optimizations made the lighting engine 3-4 times faster, which would allow for 3 light channels (RGB) instead of one for no degradation over vanilla - 1.6.4, that is). Also, as mentioned by somebody else you seem to be assuming that other suggestions will be added (I haven't checked to see if you suggested that diamonds generate in the End in a different suggestion but this is what it sounds like, and there is no mention of how common "the same rate as diamonds in the end" is). I don't think this is entirely impossible if it worked like a sponge, and the redstone would come back in the next block update, making it useful for stopping redstone clocks. Alternatively, this could transform certain power sources in the area into versions of the block with no power output and could prevent buttons and switches from doing anything when activated. I'm gonna say no on this one, though. Although there are some other options, such as having multiple outputs from the block. This might do what you need it to do. Or you could just use one output from 0-15 and round up the correct output. Sure, these things can waste some of your coal, but compare that to plutonium which is rare, difficult to mine and not a safe source of fuel. As a weapon, this may come in handy, although it seems to have effects which are a little too similar to the lingering potion of harming. Personally, I think a tier two TNT (probably the only radioactive-related thing not mentioned here) would be a more useful addition to the game than the radioactive furnace. People say that TNT is useful for mining, but it's actually not that great when trying to remove large areas of land. A tier two TNT that could blast through large hills would actually be incredibly useful when flattening large areas of land to build projects in survival. That being said, I don't think I can support this suggestion. While you talk about plutonium being overpowered, it's actually just a little too underpowered compared to what is already available in the game. I was considering Uranium (first found in the 1700's, which fits more with the "Minecraft" timeframe) but I think Plutonium sounds cooler. I really don't believe Minecraft has a set time frame. As long as it isn't obnoxious. Diamonds don't generate in the end, and the plutonium is only found in the end. There is a noticeable difference between torchlight, skylight, and end rod light color. It wouldn't be exact colored lighting, but would be very useful in modern/futuristic builds. 32 redstone power could be created without changing the game's code by making the first 16 blocks at power level 16 (if that makes sense). Also, I am not suggesting any change to diamond generation here. I always like new ores with unique properties. The problem with this is that it just sounds largely redundant; why mine an ore with infinite power that has a chance of exploding and contaminating when coal is already massively common, and lava is so easy to collect? It does give the player an option of course, but it doesn't sound strictly all that useful. A lava bucket is far more efficient and easy to gather, especially when a meltdown could potentially occur every four minutes. If it had more uses it would be fairly good, but right now I can't see much point in it. My thinking was by having nuclear power smelt thrice as fast, it would be useful. Perhaps changing it to even faster would be a better option. What about 8 times original smelting speed? I'm with Tartarus. You're too afraid that we'll say it's overpowered so you've added a drawback that makes it unusable. If you have reached the End you will be able to farm blaze rods, get lava from the Nether, and you probably have a lot more coal than you need. Fuel is very much a solved problem at that stage so it's hard to justify risking explosions just to save fuel. - Cooking food with such a furnace is a terrible idea and would probably give you cancer. So cooking meat will give you rotten flesh and potatoes will become poisonous potatoes. I'm not sure about kelp, but you get the idea. - There is no risk of meltdown when it is smelting, but if it is not smelting it builds up heat and eventually melts down. So you cannot simply set it and forget it like you can with regular fuels, but you can use it without risk if you are careful. Building up heat forces micro-management, since you'd always be having to fill it up or get rid of it. I prefer having plutonium only become risky when it is being used. 32 block output was one of the biggest purposes for plutonium, but if that isn't possible I can see why it would be considered pointless. What if plutonium was 8x as faster? You could smelt a stack of iron within 10 seconds. A tier two TNT is added by combining plutonium with an ignited TNT, which creates a blast equal to a charged creeper. Perhaps a tier three TNT could be added with a block of plutonium? Eight times faster sounds somewhat useful. Why call it plutonium if it has almost nothing to do with real life plutonium? Why not just call it "plutinium" or "plutendium" or something? - The ore shouldn't have the same pattern in the rock as most Overworld ores. It should be something unique. For example, Nether quartz has a completely unique pattern because it's in the Nether. - The raw plutonium looks too much like a fermented spider eye. Maybe you should change it to something else. The idea of an End ore is really cool and I can totally get behind your motivation for its suggestion, but I disagree with how this suggestion was approached. As others already stated, plutonium would actually be rather underpowered as suggested, but instead of dwelling on criticisms that have already been made, I'll try to give my own perspective on what I figure an End-game ore (ambiguity intended) could do. Since this new ore takes inspiration from a radioactive element, why not embrace the idea literally and make the plutonium block* a light source that can actually illuminate through solid blocks? It could have moderate luminance and/or only activate this effect by redstone powering. This alone would have many uses for adventure settings, buildings, and ambiance in general. Taking inspiration both from the "power" aspect of plutonium ore and floating (and lingering maybe?) 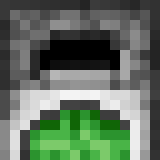 mechanics, a very natural idea would be a potent slime block** which would differ from regular slime blocks in exactly two ways: it would have some tiny luminance for consistency (~3?) and would bounce entities/players with 100% efficiency (up to some velocity cap, such as that required for players to go 256 blocks upwards). Another fun/useful use for plutonium could be for floating in mid air in a similar way to underwater bubble mechanics, but not quite the same. The way I envision it, a new activated soulsand*** block could provide a limited floating effect when redstone powered. Limited both time-wise (would last just a couple of seconds) and height-wise (would only affect up to a handful of blocks right above it). This would be extremely useful for automatic elevators, games, pranks and so on, but on the whole, given its limitations, not too overpowered. And yes, it could have some tiny luminance as well (again, for consistency). Okay, now this is an ephemeral use, but hopefully not mundane. How about if plutonium could be used as an enchantment material that when applied to tools would make mobs/items shortly levitate? The way I envision it, unenchanted tools/weapons would be enchanteable in crafting tables for up to a limited amount of charges, and when items are obtained from or entities are struck by them, they would be yielded a little levitation effect, smaller than that from shulkers. This could allow for very interesting combat dynamics, specially for PvP, and I don't think this would be overpowered since weapons with levitation effect wouldn't be able to have any other effect (to balance things out, maybe the effect is even smaller for PvP combat). Disclaimer: I'm not sure if all or any of the above suggestions are actually good. I mean, I like them, otherwise I wouldn't have suggested, but admittedly, I haven't really thought them through. I just brainstormed for a little bit on what interesting properties could some plutonium/End based ore have, and developed them a bit further. Another disclaimer: please be patient with eventual grammar and general language mistakes (and point them out politely), as English is not my first language. *** Obtained from soulsand with 3 plutonium ores (one on each side, one on top). I don't really like any of the potential uses. 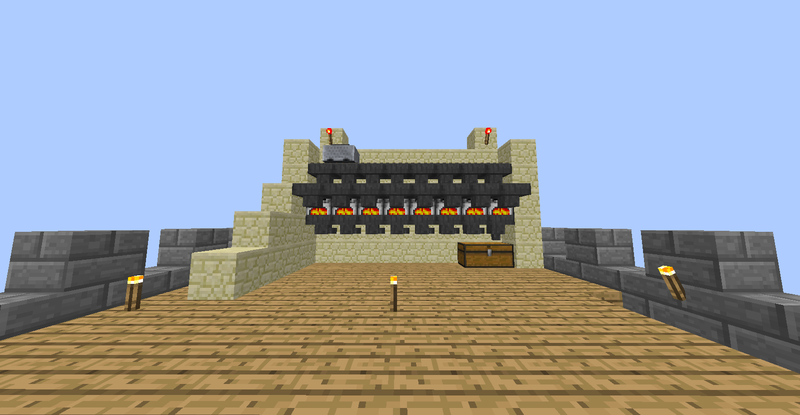 If you are already puttering around in the end, you likely use automated systems for smelting via hoppers already. Adding a new smelting resource with a speed bonus that needs to be micromanaged (and still risks explosion) isn't just annoying, its really dangerous. For example, I designed an extremely efficient furnace, which breaks the hopper speed limits by about 4x (filling a double chest in about 4 minutes). If someone decided it would be funny to dive into my furnace and drop a couple plutonium ores into some of the furnaces, the whole thing could get destroyed a lot more sneakily than using TNT. I don't like the redstone effects either. 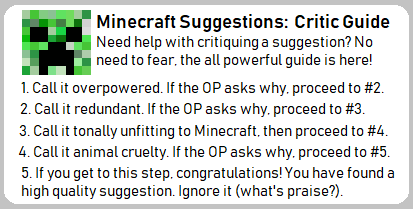 This has a ton of grief potential, and no real redstone circuitry potential. I do like the idea of an explosion that results in a poison gas cloud, but that doesn't sound too far from lingering arrows. 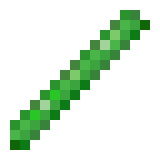 The only one left that sounds interesting is the rods that give off light and radiation damage, but that just seems so out of place with the rest of minecraft. Hmm, I’m gonna say no to this one. It sounds far too complicated for the vanilla game. Also, if it was ever implemented I would never use it, too much risk. For an apocalypic mod this might work nicely (possibly even for some modern/futurist settings), but the "look & feel" are too much a break from the vanilla MC setting for my tastes. With a name change [illogical, but Plutonium just sets the wrong feel; Unobtanium is only slightly better, something more fantasy themed but more imaginative than end crystal is needed],the main parts of this might work. A permanent furnace fuel in the end game would be a conveniece not a game changer – no need for a countervailing weakness. A redstone anti-signal [aRS] where the effective signal strength was RS strength minus aRS strength could open the possibility of new types of devices. How aRS works with comparators, repeaters, etc needs to be detailed. For instance, running aRS into the side of a comparator in 'subtract' mode could result in adding the aRS strength to the input RS signal strength would alone open new areas as it is not currently possible to add a set amount to a signal. Once one gets away from thinking of how to bring a radioactive element into the game and treats this as a proposal for a new end game wu-wu power block all sorts of things become possible. Chafipe's post nicely illustrates the kind of thing one can come up with once one ceases adapting a real world material and simply tries to add [potentially] 'cool stuff'. OFF-TOPIC, but trace amounts of plutonium have benn found to occur naturally in uranium ores.